Miscellaneous police forces, mostly having their foundations in older legislation or common law. These are responsible for policing specific local areas or activities, such as ports and parks. Before the passing of recent legislation such as the Serious Organised Crime and Police Act 2005, they were often referred to as 'special police forces'; care must therefore be taken in interpreting historical use of that phrase. These constabularies are not within the scope of the legislation applicable to the previously-mentioned organisations but can still be the subject of statutes applicable to, for example, docks, harbours or railways. Until the passing of Railways and Transport Safety Act 2003, the British Transport Police was such a force. The majority of law enforcement in the United Kingdom is carried out by territorial police forces that police the general public and their activities. The other types of agencies are concerned with policing of more specific matters. 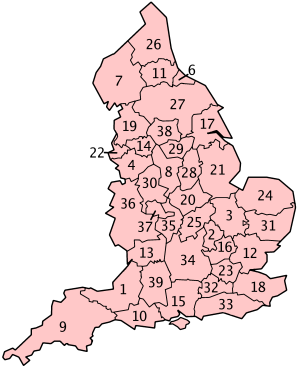 Except in Greater London, each territorial police force covers one or more of the local government areas (counties) established in the 1974 local government reorganisations (although with subsequent modifications), in an area known in statute as a police area. These forces provide the majority of policing services to the public of England and Wales. These forces have been known historically as "Home Office police forces" due to the Acts of Parliament that established them although use of that description was only correct for the Metropolitan Police and in that case ceased to be so when local control was transferred from the Home Office to the Metropolitan Police Authority. Despite the implication of the term, all police forces are independent, with operational control resting solely with the chief officer of each force (the Chief Constable or with regard to the Metropolitan Police and City of London Police forces, their respective Commissioners); each force was overseen by a Police authority until these were replaced by Police and Crime Commissioners in 2012. The Police Act 1996 is the most recent piece of legislation, which outlines the areas of responsibility for the 43 territorial forces of England and Wales (found in Schedule 1 of the Act). Constable is the lowest rank in the police service, but all officers, whatever their rank are "constables" in terms of legal powers and jurisdiction. Police officers in territorial police forces in England and Wales derive their jurisdiction from Section 30 of the Police Act 1996. This section outlines that such officers have jurisdiction throughout England and Wales and also the adjacent United Kingdom waters. Special Constables, who are part-time, volunteer officers of these forces, used to have a more limited jurisdiction – limited solely to their own force areas and adjacent forces (collectively, their "constablewick"). Since 1 April 2007, however Special Constables of England & Wales have full police powers throughout those two countries. This means that, in contrast to the majority of countries, all UK volunteer police officers now have exactly the same powers as their full-time colleagues. There are a number of situations in which the jurisdiction of a constable extends to one of the other countries – see the main article for details. Alliance Police: Gloucestershire Constabulary, Avon & Somerset Police and Wiltshire Police. Most police powers and functions have been inherited by the Scottish Government and Scottish Parliament from the Scottish Office. Areas for which legislative responsibility remains with the UK Government include national security, terrorism, firearms and drugs. The Police (Scotland) Act 1967, as amended, was the basis for the organisation and jurisdiction of the eight former territorial forces in Scotland that were formed in 1975. These forces covered one or more of the areas of the local government regions established in the 1975 local government reorganisation (and since abolished), with minor adjustments to align with the post-1996 council area borders. These forces provided the majority of police services to the public of Scotland, although Scottish police officers also have limited jurisdiction throughout the rest of the United Kingdom as required (See above comments under English and Welsh forces). In 2011, the Scottish Government announced that it planned to amalgamate the eight territorial forces in Scotland, along with the Scottish Crime and Drug Enforcement Agency, into a single agency. The Police and Fire Reform (Scotland) Act 2012, an Act of the Scottish Parliament, codified this amalgamation and brought about the new Police Service of Scotland (to be known as "Police Scotland"). The new force was established on 1 April 2013. In 2017, plans were being debated in the Scottish Parliament to merge railway policing with Police Scotland. Community Support Officers, commonly referred to as "Police Community Support Officers", were established by Section 38(2) of the Police Reform Act 2002, which applies only to England and Wales. There are therefore no Community Support Officers in Scotland. County and borough based police forces were not formed in Ireland as they were in Great Britain, with instead a single Royal Irish Constabulary covering most of Ireland (the exceptions being the Dublin Metropolitan Police, which was responsible for policing in Dublin, and the Belfast Town Police force, which was replaced by the RIC in the 1880s). The Royal Ulster Constabulary was formed in 1922 after the establishment of the Irish Free State, and served until the reforms of the police under the terms established initially by the Good Friday Agreement of 1998 undertaken by the Patten Commission, which led to the renaming of the RUC in 2001. The Police (Northern Ireland) Act 2000 sets out the basis for the organisation and function of the police force in the province. Until 2010, police powers were not transferred to the devolved Northern Ireland Executive, unlike Scotland, instead remaining with the Northern Ireland Office. However, in January 2010 agreement was reached between the two largest parties in the Assembly, the DUP and Sinn Féin, over a course that would see them assume responsibility for policing and justice from April. These bodies operate in more than one county of the United Kingdom. The remit of some of the forces is further limited to the areas that they police, such as railway infrastructure. The Anti-terrorism, Crime and Security Act 2001 gave the British Transport Police and Ministry of Defence Police a limited, conditional authority to act outside of their primary jurisdiction if the situation requires urgent police action and the local force are not readily available, or if they believe that there is risk to life or limb, or where they are assisting the local force. National Crime Agency (NCA) – An agency that leads UK-wide activities to combat high-level crime such as organised crime. In addition, the NCA acts as the UK point of contact for foreign law enforcement agencies. It replaced the Serious Organised Crime Agency in 2013. Border Force is a part of the Home Office, responsible for frontline border control operations at air, sea and rail ports in the United Kingdom. Employees of Border Force may be Immigration Officers and/or customs officers. They hold certain powers of arrest, detention and search in addition to those available to Any person in England and Wales or to any person in Scotland and Northern Ireland. Police-like powers are exercised by border officers and inland immigration enforcement officers. Immigration Enforcement The agency also has a specialist criminal investigations directorate. Her Majesty's Revenue and Customs. Since the creation of the UK Border Agency (now Border Force), staff of HMRC no longer perform frontline duties at ports of entry. The remainder of the staff with law enforcement powers employed by HMRC consists of the Criminal Investigation Branch, who, as customs officers, continue to exercise the powers granted under the Customs Management Acts and the Police and Criminal Evidence Act 1984 including arrest. Environment Agency Fisheries Enforcement Officers/Water bailiffs have powers of a constable under the Salmon and Freshwater Fisheries Act 1975. Officers/bailiffs protect fish and combat related crime (e.g. poaching). Ministry of Defence Police – A police force tasked with providing armed security, uniformed policing, and investigative services to Ministry of Defence installations throughout the United Kingdom. Civil Nuclear Constabulary – A police force responsible for providing law enforcement and security at or within 5 km of any relevant nuclear site and for nuclear materials in transit within the United Kingdom. British Transport Police (Great Britain) – A police force responsible for providing law enforcement at certain railways and light-rail systems in Great Britain. National Wildlife Crime Unit – A police unit run by the ACPO that gathers intelligence on wildlife crime and provides analytical and investigative support to law enforcement agencies across the United Kingdom. National Counter Terrorism Security Office – A police unit run by the ACPO, which advises the British government on its counter terrorism strategy. National Vehicle Crime Intelligence Service – A police unit run by the ACPO, tasked with combating organised vehicle crime and the use of vehicles in crime. National Domestic Extremism and Disorder Intelligence Unit – A police unit that is part of the Metropolitan Police Service Specialist Operations Directorate, tasked with coordinating police response to domestic extremism across the United Kingdom. Protection Command – A police unit that is part of the Metropolitan Police Service Specialist Operations Directorate, responsible for providing protective security to the government/diplomatic community and the Royal Family within the United Kingdom. National Fraud Intelligence Bureau – A police unit hosted by the City of London Police, tasked with combating economic crime throughout the United Kingdom. National Ballistics Intelligence Service (Great Britain) – A police unit hosted by West Midlands Police, tasked with gathering and disseminating fast time intelligence on the criminal use of firearms across Great Britain. National Police Air Service (England and Wales) – A police aviation service hosted by West Yorkshire Police, that provides centralised air support to the 43 territorial police forces in England and Wales. These organisations are not police forces but do have similar powers to that of the police with the exception that they cannot arrest a person nor make forcible entry without a warrant. The Independent Police Complaints Commission (England and Wales) investigates complaints against police officers and staff of the police forces in England and Wales, and staff of HM Revenue and Customs, the National Crime Agency in England and Wales and the Border Force. Certain investigators of the IPCC, for the purposes of the carrying out of an investigation and all purposes connected with it, have all the powers and privileges of constables throughout England and Wales and the territorial waters. The use of investigatory powers is controlled by the Regulation of Investigatory Powers Act 2000. Up to 792 public authorities have powers that are restricted by RIPA. These police forces generally come under the control of a local authority, public trusts or even private companies; examples include some ports police and the Mersey Tunnels Police. They could have been established by individual Acts of Parliament or under common law powers. Jurisdiction is generally limited to the relevant area of private property alone and in some cases (e.g. docks and harbours) the surrounding area. This, together with the small size of the police forces, means they are often reliant on the territorial force for the area under whose jurisdiction they fall to assist with any serious matter. The statutory responsibility for law and order sits with the territorial police forces even if there is a specialist police force in the locality. These police forces do not have independent Police Authorities and their founding statutes (if any) do not generally prescribe their structure and formation. There are two types of port police in the United Kingdom — most are sworn in under the 1847 Act, but a few have Acts specific to their port. For every port/harbour, an individual Act of Parliament (or, more recently, a Harbour (Revision) Order) can incorporate parts of the Harbours, Docks, and Piers Clauses Act 1847 (HDPCA) and apply them to that specific port/harbour. Officers of port police forces are sworn in as "special constables" under section 79 of the 1847 Act, as incorporated by the individual local Act. As a result, officers have the full powers of a constable on any land owned by the harbour, dock, or port and at any place within one mile of any owned land. The Marine Navigation Act 2013 has potentially enabled ports contables in England & Wales to act as constables beyond this one mile limit, in relation to policing purposes connected with the port only, in a police area where consent has been obtained from the relevant Chief Constable. This act does not however give general police powers to ports constables beyond their core jurisdiction as set out in the 1847 act, merely in relation to policing purposes connected to the port as set out in the Act. As of 2014, 3 ports police forces (Dover, Teesport and Bristol) have sought and received consent from the local Chief Constable, with a fourth (Liverpool) in the process of applying for it. This has enabled these 3 ports forces to act as constables, in relation to policing purposes connected to the port, throughout the police area in which they are geographically located. There are 224 constables sworn in under the 1847 Act. Serious or major incidents or crime generally become the responsibility of the local territorial police force. A large, new port on the Thames Estuary (and within the Port of London area) called "London Gateway" is currently under construction, and the owners have the authority to create their own police force for the port. These small constabularies are responsible for policing specific land and parks. Officers of these forces have the powers of a constable within their limited jurisdiction. They are not constables as dealt with in the general Police Acts. Constables of this force have full police powers whilst on land belonging to the Royal Botanical Gardens as per the Parks Regulation Act 1872 as amended by section 3 (a) of the Parks Regulation (Amendment) Act 1974. The Parks Regulation Act 1872 provides for the attestation of parks constables. Over history, a number of local authorities outside London have maintained their own parks police forces, the most notable being Liverpool (Liverpool Parks Police) and Birmingham (Birmingham Parks Police). No local authority parks police forces currently exist outside London, although the legal powers for them to do so (granted by various local Acts of Parliament) survive in a limited number of cases. In London, these constabularies are responsible for enforcing byelaws within the parks and open spaces of their respective local authorities. Members of the constabularies are sworn as constables under article 18 of the Greater London Parks and Open Spaces Order 1967. Members of the constabularies are constables only in relation to the enforcement of the parks byelaws (which, by definition, apply only in the parks). Parks Police Service, created through the merger of Hammersmith and Fulham Parks Constabulary and Royal Borough of Kensington and Chelsea Parks Police in 2013. Hampstead Heath Constabulary, also appointed under the Corporation of London opens spaces act sec 16, 1878 with the full powers and privileges of a Police Constable. Some of these constables have (or have had) a shared role as security staff for their own local authority's buildings and housing estates with appropriate changes of badges and/or uniform being made when changing to/from park duties. Cathedrals that have their own Constabularies consisting of attested constables that keep the peace at each Cathedral. Cambridge University Constabulary – attested under the Universities Act 1825 as constables within the university precincts and up to four miles from them. Northern Ireland Security Guard Service – Civilian Security Officers belonging to the Northern Ireland Security Guard Service are attested as Special Constables. In the UK, the service police exercise jurisdiction over those serving in the military in any capacity and those civilians subject to service discipline as defined by the Armed Forces Act 2006. They are not 'constables' and do not have any policing powers in relation to the general public in normal circumstances. In British Forces Germany, under the Status Of Forces Act, military police have jurisdiction over British Forces personnel, their families, MOD contractors, and NAAFI staff. Service Police are PACE trained and all investigations are PACE compliant. They make regular use of civilian police facilities often conducting joint investigations where necessary. The Service Police are able to investigate all crime within their jurisdiction, up to and including Murder, however within the UK, offences of murder and sudden deaths are passed to the local police force as per national jurisdiction agreements. Whilst operating in conflict zones the military police will conduct the full range of policing including murder investigations as evidenced by the Sgt Blackman investigation. The Isle of Man Constabulary (Meoiryn-Shee Ellan Vannin) is the police service of the Isle of Man. The Isle of Man Airport Police polices the main Isle of Man Airport (in Ronaldsway), with officers who are "warranted constables" under the Isle of Man Airports and Civil Aviation Act. The States of Jersey Police (Police d'États de Jersey) is the police service of Jersey. It was established in its current form by the Police Force (Jersey) Law, 1974 and consists of around 240 officers. Honorary Police – There is an Honorary Police (French: Police Honorifique) force in each parish in Jersey. Honorary Police officers have, for centuries, been elected by parishioners to assist the Connétable of the Parish to maintain law and order, and to this day the only person who may charge a person with an offence is the Centenier of the parish in which the offence allegedly took place. Officers are elected as Centeniers, Vingteniers or Constable's Officers, each with various duties and responsibilities. The States of Guernsey Police Service (États de Guernesey Service de police) is the local police force for the Crown dependency of Guernsey. In addition to providing police for the island of Guernsey itself, the Guernsey Police also provides detachments for the islands of Alderney, Herm and Sark. Guernsey Border Agency, responsible with policing cross border and financial crime, customs and immigration. Garda Síochána – Under an agreement between the British Government and the Irish Government and under the United Nations Convention on the Law of the Sea, the Garda Síochána and the Radiological Protection Institute of Ireland are allowed to inspect the Sellafield nuclear facility in Cumbria. Police aux Frontières – As part of the Channel Tunnel agreement between the British and French governments, the Police aux Frontières maintains a presence at St. Pancras International, Ebbsfleet International and Ashford International railway stations and on Eurostar trains. The British Transport Police have a reciprocal arrangement at the Gare du Nord in Paris. The Police aux Frontieres also maintain a presence at passport control at the Eurotunnel terminal in Folkestone and at Dover port, whilst Kent Police maintains a presence at Coquelles on the French side of the tunnel. Similar arrangements allow the Border Force to operate juxtaposed controls in France and Belgium. Military Police of visiting forces while present within the terms of the Visiting Forces Act 1952. ^ a b c d e APA Police Service Strength Map Update Archived 7 October 2011 at the Wayback Machine, Association of Police Authorities, 28 August 2010. ^ Authority, Scottish Police Services. "Police Scotland - Police Scotland". www.scotland.police.uk. Archived from the original on 7 April 2013. ^ "Name change for police force". This is Cornwall. 8 March 2010. Archived from the original on 3 May 2012. Retrieved 26 September 2011. ^ "An Act for the regualtion of Royal Parks and Gardens" (PDF). UK Government. 27 June 1872. Archived (PDF) from the original on 27 June 2013. Retrieved 25 April 2015. ^ "Ministry of Defence Police and Guarding Agency Annual Report 2005-2006" (PDF). Archived (PDF) from the original on 26 September 2007. ^ "Police Reform Act 2002 (c. 30)". Opsi.gov.uk. Archived from the original on 6 August 2009. Retrieved 21 June 2009. ^ Rayner, Gordon (12 April 2008). "Council spy cases hit 1,000 a month". Telegraph. Archived from the original on 9 August 2009. Retrieved 21 June 2009. ^ "Marine Navigation Act 2013". www.legislation.gov.uk. Archived from the original on 17 December 2017. Retrieved 16 December 2017. ^ "Police: Ports:Written question - 203891". UK Parliament. Archived from the original on 16 December 2017. Retrieved 16 December 2017. ^ "Accountability and Standards of the Port Police Forces". Dft.gov.uk. Archived from the original on 6 April 2009. Retrieved 21 June 2009. ^ Kelly, Amanda. "THE MANAGEMENT AND OPERATION OF THE RESPONSE BRANCH OF THE COUNCIL'S CRIME AND ANTI-SOCIAL BEHAVIOUR SERVICE" (PDF). Website of London Borough of Newham Council. London Borough of Newham Council. Archived (PDF) from the original on 9 February 2012. Retrieved 26 December 2011. ^ "Northern Ireland Security Guard Service - PoliceSpecials.com Forum". Archived from the original on 4 January 2013. Retrieved 16 March 2012. ^ "Armed Forces Act 2006". www.legislation.gov.uk. Archived from the original on 22 December 2017. Retrieved 20 December 2017. ^ "Police and Criminal Evidence Act 1984". www.legislation.gov.uk. Archived from the original on 7 May 2012.